Happy Easter! For me, Easter Sunday means waking up early, taking a walk in the crisp early spring air, singing some hymns during the morning service at Grace Church on Broadway and 10th, and cooking up some good food to enjoy throughout the long, leisurely day. I caught an episode of Jamie Oliver's Food Revolution online last night and it made me crave one of his healthy, easy meals, so I flipped through my copy of "Cook with Jamie" and settled upon this recipe called Jools' Favorite Saturday Afternoon Pasta since I already had most of the ingredients in my pantry. It's easy and light and has a distinct taste of spring--perfect for a quick solo Easter meal for those of us stranded in NYC with no family nearby. A note: when you're shopping for the ingredients to this dish, make sure you buy the best quality tuna you can find. It will make all the difference. Heat a splash of olive oil in a heavy-bottomed pan and cook the onion, chili, cinnamon and basil stalks on a medium to low heat for 5 minutes until the onion has softened and is slightly sweet. Turn up the heat and add your tomatoes, tuna and a good pinch of salt. Break the tomatoes up using the back of a spoon, then bring to the boil and simmer for about 20 minutes. Taste for seasoning. Meanwhile, cook the rigatoni in a pan of salted boiling water according to the package instructions. When al dente, drain the pasta in a colander, reserving some of the cooking water. 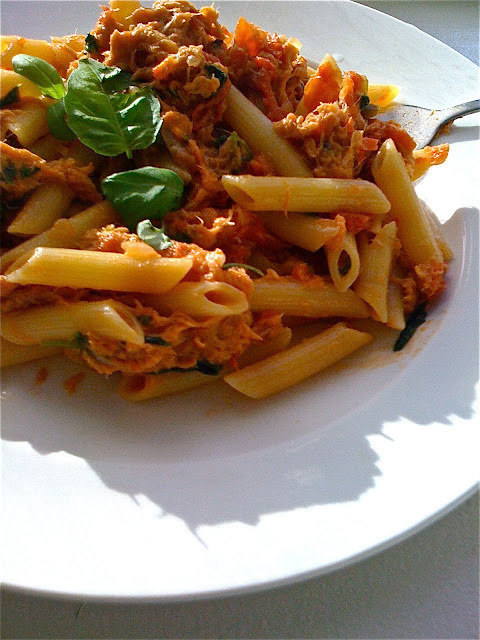 Toss the pasta into the tuna and tomato sauce with the roughly torn basil leaves, a glug of olive oil, the lemon zest and juice and Parmesan and mix together well. Loosen the pasta with a little of the reserved cooking water if needed. Check the seasoning and serve immediately.